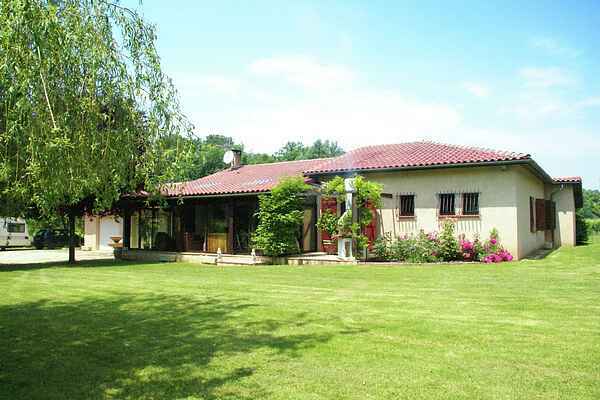 This lovely detached vacation home is located in the heart of Gascony, between Eauze and Lannepax (both 8 km). Along with a few other homes, it is quietly situated and concealed between the woods and vineyards. There is a large enclosed lawn surrounding the property with shady trees and plenty of room for the children to play. At the front there are flowerbeds with palm trees and rose bushes. The rolling countryside offers beautiful excursions toward the east to the picturesque villages of Jegun (28 km) and Lavardens (35 km). If you want to swim, head to Lupiac (18 km), Aignan (20 km, canoeing as well) and Cazaubon (26 km). A bakery, supermarket, swimming pool, 18-hole golf course, tennis court and horse riding can be found in Eauze (8 km). Visit the medieval city of Auch (30 km), with its monumental stairway, the 15th century cathedral of Sainte-Marie, and the 40 meter high prison tower, Tour d'Armagnac. The city is renowned for its large statue of D'Artagnan, the most famous of the three musketeers. He was born around 1610 in the castle of Castlemore near Lupiac (30 km). If you are a music lover, head over to Marciac (50 km) and take a trip through time in the Jazz Museum.